What is air conditioner expansion valve? The expansion device is the fourth major component in air conditioner units. It’s also known as meter devices. The meter device is located indoor (air handler) units with the evaporator coils. It’s small and hard to see, unless you open the evaporator compartment. The meter devices process is showed between points 5 and 6 in PH charts. The thermostatic expansion valve (TEV or TXV) is used for refrigerant flow control and operates at varying pressures resulting from varying temperatures. This valve maintains constant superheat in the evaporator. Thermal expansion valve has a sensing bulb, which is connected to TXV by a length of capillary tubing. The capillary tube transmits sensing bulb pressures to the top of the TXV valve’s diaphragm. A capillary tube is a refrigerant control; its common types of air conditioner expansion valve. The capillary is simply a length of tubing with a small inside diameter which acts as a constant throttle on the refrigerant entering the evaporator. A fine filter or filter drier installed at the inlet of the capillary prevents dirt from blocking the tube. A recent development in the design of capillary tubes for air conditioning system uses capillary tubes with a larger insider diameter and a longer tube length. A larger diameter tubes are less likely to become plugged with dirt and other impurities than a smaller diameter tube. The long length provides the necessary resistance to create the desired pressure difference across the metering device. The capillary tube equalizes the pressure in the system when the unit stops. This pressure equalizing characteristic of the capillary allows a low starting torque motor to be used with the compressor. Typically, a capillary does not operate as efficiently over a wide range of conditions as does the thermostatic expansion valve. However, because of its counterbalance factors in most applications, its performance is generally very good. Refrigeration systems using a capillary tube doesn’t require the use of a liquid receiver since all the liquid is stored in the evaporator during the off cycle. However, a suction accumulator is often found in the suction line to prevent any non vaporized refrigerant from reaching the compressor. This will prevents damage to the compressor when excessive liquid refrigerant enters the evaporator on a low evaporator load condition. How does capillary tube works? The capillary tube can be described as a fixed length of small bore tubing connecting the high pressure side (condenser) of a refrigeration system to the low pressure side (evaporator). Capillary tube works by restricting and metering the liquid flow, the capillary tube can maintain the required pressure differential between the condenser and the evaporator. Because of friction and acceleration, the pressure drops as the liquid flows through the tube. In order to reduce the temperature of the liquid to the saturation temperature of the evaporator, some of the liquid must turn into a vapor in the capillary tube, “flash”, just as it does with all refrigerant controls. *Notes: All air conditioner expansion valve works in similar fashion. It shapes, size, capacity, and manufacture are different, but it operation principle are alike. The capillary tube diameter and length must be such that the flow capacity at the design pressures (condensing and evaporating) equals the compressor pumping capacity at these same conditions. For example, if the tube diameter is too small (resistance to high) the liquid refrigerant flow will be less than the pumping capacity of the compressor with the evaporator being “starved” and the suction pressure being low. Less liquid will enters the evaporator and the excess will build up in the condenser reducing the effective condensing surface and increasing the condensing temperature and pressure. This pressure change tends to increase the flow in the tube and at the same time reduces compression capacity. The system will now balance at different from design capacity with a reduction in compressor and system capacity. If the capillary tube resistance to the refrigerant flow is too low, (diameter of tube too large) the flow rate will be greater than pumping capacity. This results in the flooding or overfeeding of the evaporator and flood back of liquid to the compressor. The refrigerant system uses a capillary tube selected for capacity balanced conditions. A liquid seal is present at the capillary inlet but not excess liquid in the condenser. The compressor discharge and suction pressures are normal and the evaporator is properly charged. How does air conditioner expansion valve works? AC expansion valves work by controlling the amount of refrigerant flows to the evaporator coils. It acts as restriction to provide a specific amount of refrigerant flows into the evaporator coils. This is the basic principle behind any metering valves. First: It controls the amount of liquid refrigerant entering the evaporator coils. The amount of liquid refrigerant entering the evaporator must equal the amount of refrigerant boils in the evaporator coils. Second: It maintains a pressure difference between the high and low pressure sides of the system to permit the refrigeration to vaporize. 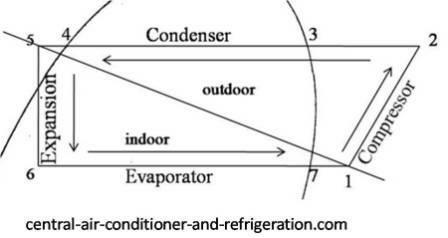 The pressure difference allows the ac Freon to vaporize at low pressure and temperature in the evaporator; while at the same moment, the refrigerant in the air conditioner condenser condenses at a high pressure, high temperature in the condenser units.